Create a new weeknight fave with this Sun-Dried Tomato-Bacon Risotto. 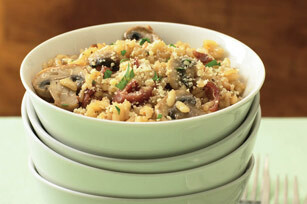 This delicious Sun-Dried Tomato-Bacon Risotto is sprinkled with Parmesan cheese and parsley. Cook broth and water in saucepan until heated through. Meanwhile, cook and stir bacon in large skillet on medium-high heat 5 min. or until crisp, stirring occasionally. Remove bacon from skillet with slotted spoon; drain on paper towels. Discard drippings from skillet. Return bacon to skillet. Add mushrooms; cook 3 min., stirring occasionally. Add rice and dressing; cook 1 min., stirring frequently. Stir in half of the broth; cook 5 min. or until most the broth is absorbed, stirring occasionally. Add remaining broth; stir. Cook 10 min. or until rice is tender and almost all the broth is absorbed, stirring occasionally. Remove from heat. Sprinkle with cheese and parsley. Prepare using chopped OSCAR MAYER Fully Cooked Bacon. Heat 1 tsp. oil in large skillet on medium heat. Add mushrooms; cook 3 min., stirring occasionally. Add rice and dressing; cook 1 min., stirring frequently. Continue as directed, adding bacon with remaining broth. 4 servings, 1 cup each.